Grieving is a personal and highly individual experience. How you grieve depends on many factors including your personality and coping style, your life experience, your faith and the nature of your loss. The stages of grief take time. Healing happens gradually; it can’t be forced or hurried…there is no “normal” timetable for grieving. Some people start to feel better in weeks or months. 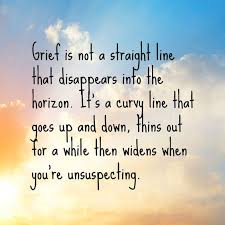 For others the grieving process is measured in years. It is important to be patient with yourself, and other members of your family, to allow the bereavement process to unfold in its own way. You are now faced with the difficult, but necessary, need to mourn the loss of this significant person in your life. Mourning is the open expression of your thoughts and feelings about the death of your loved one. It is an essential part of healing. It also raises questions of how is every one is going to cope with life moving forward. Grief is a great mental pain that occurs after the loss of a loved one. You will have to accept the fact that someone so close to you has gone. This pain is real and often the sadness and grief can be overwhelming. In our bereavement, we spend different lengths of time working through each step and express each stage with different levels of intensity. The five stages of loss do not necessarily occur in any specific order. We often move between stages before achieving a more peaceful acceptance of death. Your feelings of sadness and loss may leave you fatigued. Your ability to think clearly and make decisions may be impaired. And your low energy levels may naturally slow you down. Respect what your body and mind are telling you. Nurture yourself. Get enough rest. Eat balanced meals. Lighten you schedule as much as possible. The parent-child bond is perhaps the most fundamental of all human ties. When your mother or father dies, that bond is torn. In response to this loss you may feel a multitude of emotions… numbness, confusion, fear, relief, guilt, anger, anxiety and depression are just a few of the feelings you may have. Sometimes these emotions will follow each other within a short period of time. Or they may occur simultaneously. Imagine what it feels like to lose a spouse who you have been married to for decades. Imagine losing the person you grew up with, raised children with, laughed and cried with, and ultimately, grew old with. Imagine how that feels. It doesn’t matter if you had a rocky or a blissful marriage. You traveled your adult life with this person. Now try to imagine what happens when your spouse dies. Just sit with that for a minute. It’s common for the elderly to experience huge changes in personality after the death of a spouse. Typically there is grumpiness, unhappiness (nothing you do brings a smile), sorrow and even depression, but the one that is the most difficult to understand is the complete lack of gratitude towards you or anyone who is providing care. In fact, there’s often downright nastiness. It will help you to take a step back and put your emotions on hold for a time. It’s important that you understand that the lack of gratitude or the grouchy behavior has nothing to do with you. Next, take some time and think about how she is feeling. Walking a mile in someone else’s shoes often gives us a new perspective. Chances are really good that she’s scared – terrified really, and she doesn’t know how to express her fear of being alone. She acts ungrateful because right now, she not grateful about much of anything. She lost her life partner and she’s scared and sad and angry and she’s taking it out on you. Knowing this can help you help her to heal. 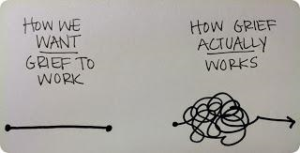 It’s a long, slow process but it can be done. Sit with your mom quietly and reassure her that you love her and that you will not abandon her. Tell her that you cannot possibly understand how she’s feeling, but you would like to try. Give her comfort by letting her know that you lost your dad, too, and you miss him and together you can remember him and share stories. Let her know its okay to do this. Ask her if she would like to talk to you or someone (a professional) about her feelings. Explain that even though you can’t replace your dad, you can give her moments of happiness and love, and that you will continue to do that. Reassure her that she won’t be completely alone. Offer to take her to see friends; get out of the house; do something fun and then let it go. Explain to her calmly that you won’t abandon her. If your mother is showing signs of serious depression; anxiety; sleeping too much; inability to sleep; withdrawing from everything; loss of appetite; lack of personal care; you will want to make an appointment with her doctor to get a proper medical assessment. Depression is serious and you don’t want to ignore these signs. Children never like the idea that their parents are getting old…. 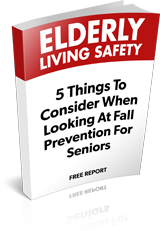 Most of us like to check in on our elderly parents regularly…but this is not always possible with our busy lives in this day and age. We are torn between our own families, work, after school activities and life in general that often spending quality time with our parents is where the feelings of guilt start. Sometimes it is distance that makes contact difficult. Melinda Smith, M.A., and Jeanne Segal, Ph.D.